UFC lightweight champ Khabib Nurmagomedov successfully defended his strap after submitting Conor McGregor via fourth-round neck crank in the UFC 229 main event on October 6 from Las Vegas. Immediately after the win, Khabib jumped over the cage fence and attacked Mcgregor’s cornerman and coach Dillon Danis. The Bellator fighter allegedly said Khabib “a f*cking Muslim rat,” however, Danis denies those allegations. That sparked riots breaking out inside and outside the Octagon. Things escalated when Khabib’s two team members attacked McGregor inside the cage. 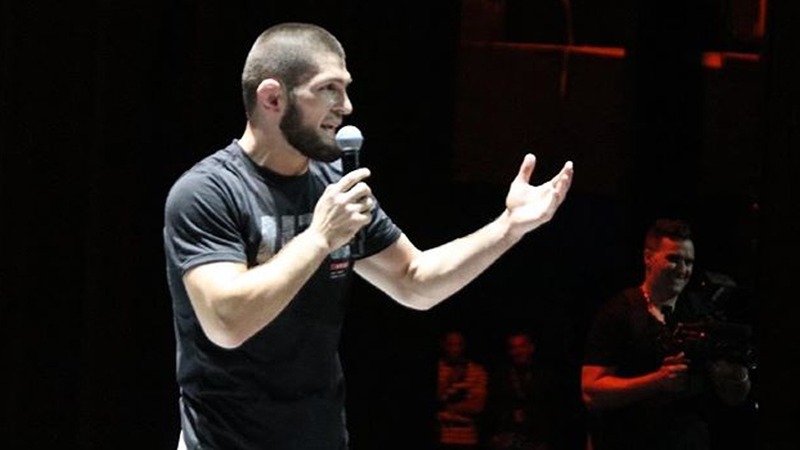 One of the fighters involved in a physical altercation with Irishman was Nurmagomedov’s friend and training partner, UFC featherweight Zubaira Tukhugov. UFC head honcho Dana White said in a post-fight presser that those fighters would never fight in the promotion again. ‘The Eagle’ is worried about Tukhugov’s future in the UFC. The promotion has already canceled his upcoming fight with McGregor’s teammate and training partner Artem Lobov. Khabib Nurmagomedov put out his terms and threatens to leave the UFC if any of his team members were cut down from the promotion. In his recent Instagram post where he particularly mentioned Tukhugov challenging Dana White to look out his threat of releasing any fighters that were involved in the post-fight UFC 229 brawl or you’ll lose me too. “I would like to address [UFC],” Khabib Nurmagomedov said in this lengthy statement. “Why didn’t you fire anyone when [McGregor’s] team attacked the bus and injured a couple of people? They could have killed someone there, why no one says anything about insulting my homeland, religion, nation, family? “Why do you have to punish my team, when both teams fought. If you say that I started it, then I do not agree, I finished what he had started. “In any case, punish me, [Zubaira Tukhugov] has nothing to do with that. If you think that I’ll keep silent then you are mistaken. You canceled Zubaira’s fight and you want to dismiss him just because he hit Conor. But don’t forget that it was Conor who had hit my another brother FIRST, just check the video. “If you decide to fire him, you should know that you’ll lose me too. We never give up on our brothers in Russia and I will go to the end for my brother. If you still decide to fire him, don’t forget to send me my broken contract, otherwise, I’ll break it myself. What do you think of this firm ultimatum from Khabib? Do you think he’s baffling or is he’s serious about this?